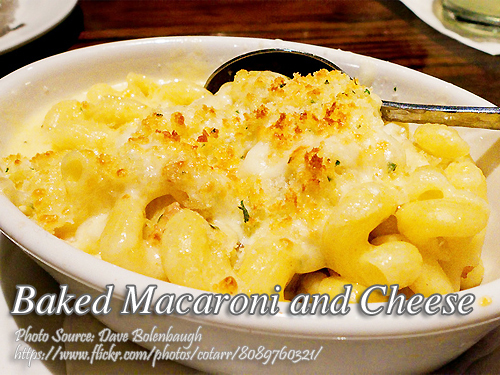 This is a classic baked macaroni and cheese which resembles the Pizza Hut style classic baked mac. I’ve modified the classic recipe to imitate the delicious baked mac of Pizza Hut by adding mozzarella cheese with the cheddar cheese. I think the oozing mozzarella cheese with the milky sauce captured my taste buds that is why I love their baked mac. You can also add ham or bacon slices to make the dish even more tastier. This is perfect for the Holiday season either for the Noche Buena or New Year’s Eve. To cook baked macaroni and cheese pizza hut style; Preheat oven to 350 °F. Cook macaroni in salted boiling water until cooked then drain and rinse with cold water. Set aside. In a large saucepan, melt butter. Add flour mixed with salt and pepper. Stir until well blended using a whisk. Then pour milk gradually stirring constantly. Bring to a boil and simmer for 2 minutes stirring constantly. Then add the cheddar and mozzarella cheese little by little and simmer until the cheese melts. Turn off heat then add the macaroni and toss until well coated with the cheese sauce. Transfer the macaroni with the cheese sauce in a buttered baking dish. Sprinkle breadcrumbs on top. Bake for 30 minutes until bubbly and the top is golden brown. Preheat oven to 350 °F. Cook macaroni in salted boiling water until cooked then drain and rinse with cold water. Set aside. In a large saucepan, melt butter. Add flour mixed with salt and pepper. Stir until well blended using a whisk. Then pour milk gradually stirring constantly. Bring to a boil and simmer for 2 minutes stirring constantly. Then add the cheddar and mozzarella cheese little by little and simmer until the cheese melts. Turn off heat then add the macaroni and toss until well coated with the cheese sauce. Transfer the macaroni with the cheese sauce in a buttered baking dish. Sprinkle breadcrumbs on top. Bake for 30 minutes until bubbly and the top is golden brown.